Frederica, Del. – Ted Garber, the Assistant Coach of the Long Island Lizards of Major League Lacrosse, returns to the Liberty National Elite Classic staff as the College Coach Recruiting Coordinator. Garber brings 40 years of lacrosse experience and an incredibly wide network to make Liberty National the top recruiting event of the summer. 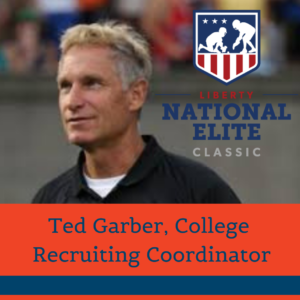 In 2018, Garber secured a coaching staff of more than 120 NCAA coaches for the inaugural Liberty National Elite Classic. The college recruiting presence at Liberty led to an elite exposure opportunity for more than a thousand elite players who traveled from all over the country to the DE Turf Complex. Coach Garber’s impressive coaching resume includes stops at six MLL teams. He has also posted successful stints as a Division 1 Head Coach (University of Massachusetts, where he was named New England Coach of the Year), a prep school head coach, and a recruiting consultant for various programs. Garber played Division 1 lacrosse at the University of New Hampshire. Garber is a member of the University of New Hampshire and Connecticut Lacrosse Hall of Fame, has won over 200 games as a college and prep head coach, and has led UNH and UMASS to numerous NCAA Tournaments. The 2019 Liberty National Elite Classic will be held on June 29-30 at the DE Turf Complex, and will be preceded by the Liberty National Elite Showcase on Friday, June 28.